"R.I.P Beverly. You will be greatly missed." 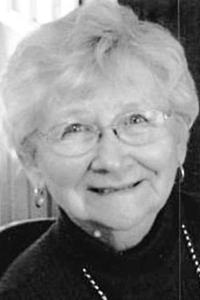 GORHAM - Beverly Jean Libby, 89, passed away peacefully from complications of Parkinson's Disease on Feb. 1, 2019, with her daughter by her side at Springbrook Center in Westbrook. She was born on June 8, 1929, a daughter of William and Beulah (Kenison) Brown. Beverly grew up in Saco and was a graduate of Thornton Academy. She spent her life dedicated to her family. A loving wife, mother, and Nana, she took pride in caring for the needs of her family. In addition to being the best family woman she could be, Beverly assisted her late husband, Hubert Libby Sr., with the family business. Bev was a skilled golfer and was a long-time member at the Gorham Country Club. In her spare time, she enjoyed giving back to people by volunteering at Mercy Hospital, Maine Medical Center and at the Gorham Food Pantry. She was a good-hearted woman with a funny and loving personality and enjoyed cooking, sewing and knitting. She is survived by her children, Bethany Jones and her husband, Greg of Gorham, and Hubert Libby Jr. of Gorham; a son-in-law, Kerry Tottle; as well as several grandchildren, great-grandchildren and nieces and nephews. She was predeceased by her husband, Hubert Libby Sr.; a son, Jim Field, a daughter, Chispa Tottle; a sister, Gladys Johnson and her husband, Walter Johnson. The family would like to extend a special thank you to the girls at Springbrook Center for their loving care, as well as Compassus Hospice. A graveside service is being planned for a later date. Arrangements are in the care of the Windham Chapel of Dolby Blais & Segee, 434 River Road, Windham. To express condolences or participate in Beverly's online tribute, please visit www.DolbyBlaisSegee.com.